The Cycladic Island of Kea is situated just 20 kilometres off the Greek mainland of Attica and is the most north-westerly island in the Cycladic Archipelago. Despite its proximity to Athens Kea has not lost its sedate island way of life and is not even crowded during the peak holiday season, although it offers some very nice beaches. International tourists rarely seem to find it, so it is mainly Greeks who have holiday homes here and spend the weekends and the summer holidays on the Cycladic Island. From the mainland Kea is only accessible from the harbour of Lavrion, not from Piraeus, the most important port; as a result, many foreign island-hoppers simply miss the island on their tour of the Cyclades. The landscape on Kea is picturesque – it is mainly hilly and in many places even rocky and steep, but also fertile and green. Amongst the stony hills there are pretty valleys with cypress trees, oak forests and olive groves. A number of orchards are cultivated by the locals and have become a characteristic feature of the valleys of Kea. The slopes are used for wine-growing and the local wine has an excellent reputation. Another Kean specialty is yoghurt with local thyme honey. Due to the fact that many wealthy Athenians own houses here as their families originally came from the island, the capital of Iloudia has experienced a gastronomic development that is very impressive indeed. Apart from a few small villages with farmhouses and stables for livestock there are only two slightly larger towns left on the island now – the harbour town Korissa in the northwest of Kea and the capital of the island, Iloudia, situated in the mountains, about 5 kilometres above Kea’s harbour. It is a very charming little town that has kept its original character. 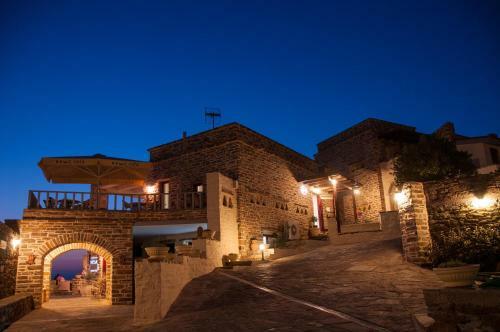 It is built in the shape of an amphitheatre amongst the hills and dates back to antiquity. Its red gables look a bit unusual and un-Greek at first sight, but the town itself has the typical maze of narrow lanes between small, white-washed houses, millions of steps and covered passages. Those who explore the southern region of the island will find breath-taking landscapes and solitary, hardly cultivated areas that look as if the centuries had by-passed them altogether. In ancient times Kea was one of the most densely populated and wealthiest islands of the Cyclades. Out of its four larger towns only Iloudia has survived, due to its protected location in the mountains. The other towns were less sheltered and became the constant target of raids and pirate attacks; eventually their inhabitants succumbed to their fate and simply left. The remains of these towns are hardly visible, and there have been no attempts to excavate them, although archaeologists assume that there might be some interesting finds. In ancient times Kea had close trade links with Athens, exporting raw materials like hematite ochre that was vital for ceramics production. The island of Kea was and still is situated on the route to the holy island of Delos, so many travellers stopped over on the way and brought additional wealth to the island. In later centuries Kea gradually lost its influential position and became a hiding place for pirates and buccaneers. For those who like authentic Greek island life, the resort of Ioulida on the island of Kea has everything you could wish for in a remote Greek island village – a maze of little lanes and steps, a charming platia with kafenions and an attractive town hall built in classic style. Everything is beautifully restored and nicely kept. There are also remnants from ancient times and the middle ages that are part of the village’s heritage. Cars are banished from the lanes and indeed you wouldn’t get far in a normal sized car anyway, there just isn’t enough space; but the absence of traffic gives the place a special atmosphere, it feels like going back in time. Building material is still carried by donkeys to sites within the village, just as it has been done for centuries. Kea is the most northerly island in the Cyclades Archipelago, and in ancient times it was quite densely populated. According to archaeologists, there were four major towns on Kea, but Ioulida is the only one that still exists today – maybe this is due to its protected location up in the mountains. It has been destroyed several times throughout history, and the old ruins became quarries for the new buildings. Ioulida is mainly a Greek holiday resort, because it is close enough to Athens to make it a weekend destination for those who need a break from city life. The historic part includes the Venetian fortress, the Agia Paraskevi Church that is built into the rock and the most important monastery of the island, Panagia Kastriani. And the “Lion of Kea”, made of carved slate in the sixth century, smiles down upon the town from its little hill just outside Ioulida. Korrissia (otherwise known as Livadi) is the small port of the island of Kea. It comes to life on a Friday night when the city dwellers from Athens arrive to spend their weekend here. They set off from the harbour of Lavrion on the Greek mainland, as there is a very infrequent or no direct ferry connection between Pireus and Korrissia. But from Lavrion, it is just a few minutes’ sailing, and yachtsmen take advantage of this. There are always sailing boats anchoring at Korrissia Harbour. Korrissia’s claim to fame is the ‘kouros’, a sixth century statue, which was found here and is now exhibited in the National Archaeological Museum in Athens. The town itself is rather unspectacular, but it has bigger supermarkets than other islands of its size; the Athenians like to do all their weekend shopping here. 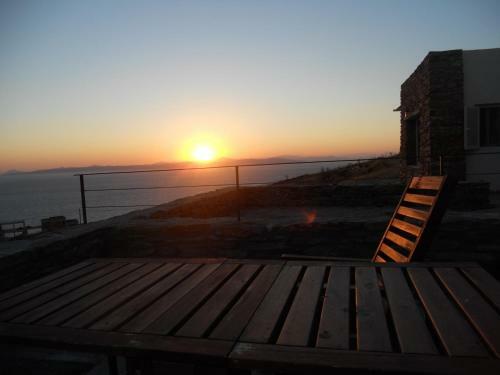 The circular bay of Otzias is located in the remote northern part of the Cyclades Island of Kea. Otzias village and Otzias beach both nestle against a bay that is so deeply cut into Kea that it almost looks like a fjord. The beach has sand and pebbles and is lined with tamarinds that provide welcome shade in the hot summer months. During the summer season holiday-makers can hire pedal boats and canoes, or even surf boards; but Kea is not the ideal place for surfing, as the beach is too sheltered. Otzias and its beach are very popular with families, as the water is shallow and safe for children to play in. The countryside behind Otzias is perfect for walks. The beautiful beach of Pissos in the south-west of Kea is hemmed in by fertile orchards and plantations that extend far into the countryside behind until they meet the impressive frame of the mountains. The special micro-climate of the bay of Pissos makes it possible to even grow bananas. The water is beautifully clear and the beach is a mixture of sand and pebbles. There is a campsite with a tavern on the beach, as well as a beach hotel with restaurant. During the summer season, there are deckchairs for hire and Pissos Beach gets a bit busier. Just off the west coast of Pissos there is a legendary place: this is where on 21 November 1916 the Britannica sank, the sister vessel of the famous Titanic, either by hitting a mine or by being hit by a German torpedo. The wreck was discovered by Jacques Cousteau and has since become a popular destination for research scientists.